Have you ever heard of this dish before? Well I assume you do, because it is a certified Filipino dish. The dish has two important parts, the crust and the creamy chicken filling. With one of those missing, this dish would not be called “chicken pastel“. 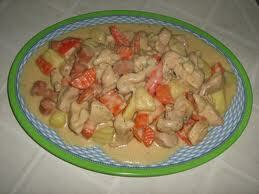 Basically, chicken pastel or “Pastel de Pollo” in Spanish is a creamy chicken dish encased in a pie crust. This is unmistakably compared to that of the “Empanada”, if you may remember one which also comes with a pie. We Filipinos, branded as “Food Innovators” came up with the new idea of replacing the crust with the rice. But then, using the crust is more popular. The creamy chicken filling is just so easy to make. Just follow the said instructions below. Also, take note that not only the chicken meat can be used on the filling, any meat will do so, but still, the most ideal is the chicken meat. For the crust, it doesn’t differ from the other crusts you know. Just make sure you have measured all the ingredients required like the flour, etc. to avoid a not-so-good- crust. So, what are the benefits we can acquire or get from this savory dish? Obviously, the main ingredient here is the chickenmeat alongside with the crust. As we all know, chicken meat is a very good source of lean, high quality protein. Protein is an essential nutrient for growth and development. On the other hand, the crust is a very good source of carbohydrates since it is made from flour. Together, this chicken filling and crust, makes up a good complete dish! So if you want try to control your carbs and protein intake, try doing this recipe! Have a less protein-and-carbohydrate meal! Have a wonderful cooking! Brown garlic in butter. Add onion, chicken (cut into small serving pieces), giblets, liver, and chorizo. Stir for 2 minutes, add 1/2 of broth. Cover; simmer for 10 minutes. Add remaining ingredients. Stir in remaining chickne broth. Lastly, add milk and thicken sauce with dissolved flour. When chicken is almost done, transfer to baking dish. garnish top with hard-boiled egg (cut into half). Cover with pie crust. Bake at 350 F for 20 minutes or until crust turns golden brown. Add salt and sugar to flour. Cut in shortening using two knives. Gradually add water. Mix with hand but do not knead. When well blended, roll out on floured board. Fit on top of prepared ‘pastel’. brush with beaten egg yolk or milk.